It amazes me why, despite having an absolutely perfect year-round climate, the vast majority of Northern Europeans only vacation on Tenerife during the winter months and it’s ironic that, when the summer arrives and Brits flock instead to Spain and the Balearics – the Spanish head to Tenerife in their droves to escape the heat of the mainland! It’s a sad fact that flights to Tenerife from the UK are not as cheap in the summer as they are in the winter and it poses the question: are flights more expensive because demand is low, or is demand low because flights are more expensive? Either way, it would appear to buck the trend in market forces which traditionally see prices dropping in line with falling demand, not rising. There are a few things about summer in Tenerife that are worth mentioning, particularly for those who have a penchant for putting. Firstly, the temperatures during the summer months average an 18 holes ideal of 25° to 27° C (75° to 80° F) with virtually no rainfall. Even in heat waves, the mercury rarely climbs beyond 35° degrees and is short lived. Contrast that with the likes of Majorca and the Algarve in Portugal where the summer averages are above 30°C and regularly send the thermometer into 40° C plus sweaty, slicing mode. The second thing to note is that Tenerife has one of the highest concentrations of four and five star hotels in Europe and if you’ve ever enjoyed the exclusivity and luxury of somewhere like the Hotel Las Madrigueras, you’ll already know how tailored their services are towards the needs of golfers. But what you may not know is that unlike hotels in mainland Spain and the Balearics for whom summer represents high season, Tenerife’s hotels drop their prices in line with reduced demand which means that you can get considerably more for your money in summer than you can in winter. Fabulously stylish hotels such as the Hotel Jardín Tropical even include green fees in their room rates during summer. But the real birdie in the benefits of summer golfing on Tenerife are the island’s summer green fees which are cropped as closely as the grass, which means you can tee off on some of Spain’s finest golf courses, like Golf Las Américas, Golf Costa Adeje and the Abama, at prices that will put an ace on every golfer’s scorecard. Okay, there’s no point in trying to busk my way through this with any attempt at credibility as anyone who’s ever placed an iron against a white dimpled ball will quickly deduce that I know diddly squat about golf. 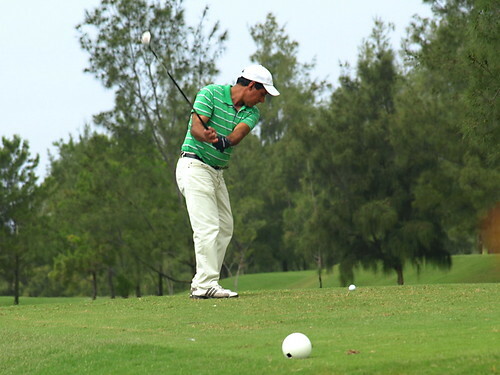 Firstly, Tenerife is an amazing destination for golfers. Where else can you tee off in warm sunshine most days of the year, on 9 fabulous, sub-tropically landscaped courses with infinity views over the Atlantic Ocean; and a whole sophisticated infrastructure of hotels, beaches, restaurants, shopping and nightlife to pass the time between rounds? Secondly, those who take up golf appear to become instantly addicted and spend what time they’re not actually on a course, plotting the quickest way to get back onto one. So, armed with these two essential facts, I’m pretty confident that to the golfing fraternity, this month’s Tenerife Magazine prize is going to cause something of a G.A.S.P. 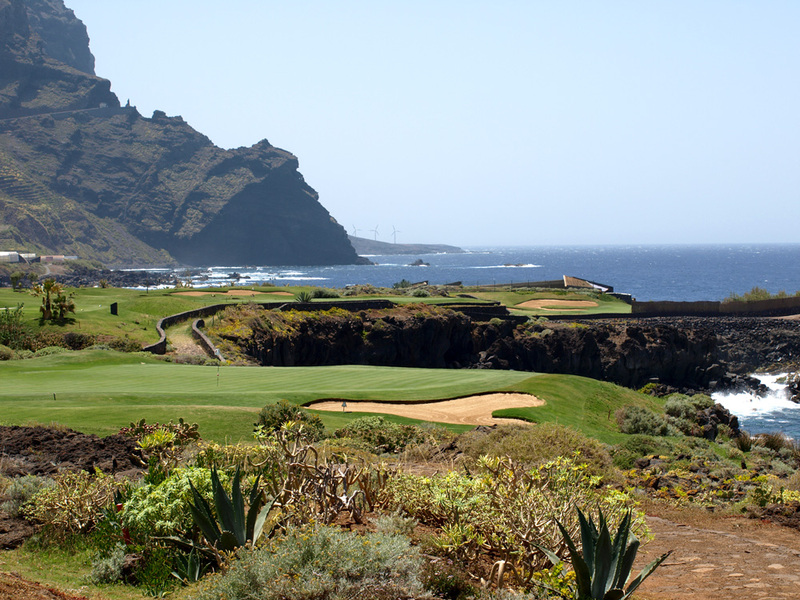 Buenavista – the stunning coastal course set at the foot of the Teno Mountains in the northwest of Tenerife. Costa Adeje – set in the sun-soaked south of Tenerife with views over the neighbouring island of La Gomera. Las Américas – an oasis of chic tranquillity set behind the popular holiday epicentre of the south. Golf Del Sur – the magnificent coastal greens of the south east of Tenerife. Tecina Golf – the Bond-like cliff top setting of La Gomera where Mount Teide shimmers on the horizon. Al you have to do, is become a fan of Tenerife Magazine on Facebook. And as it’s Tenerife’s number one online magazine jam packed with facts, features and photos about the beautiful island of Tenerife, I can’t think of a single reason why you wouldn’t want to be a fan of it anyway!